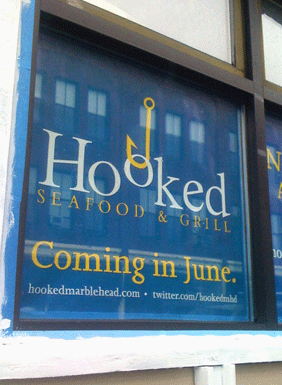 When the eye-catching blue and yellow Coming Soon signs appeared in the windows of 114 Pleasant St. in Marblehead last week, locals were impressed. Although the new restaurant, Hooked, won’t open until June, it’s already got a website with a sample menu and a twitter feed to boot. “Oh,” you might say, “A seafood restaurant in a shore town, how (yawn) exciting.” But the truth is, with its family-friendly combination of casual restaurant and take-out, Hooked’s unique approach may just be what some are looking for, especially as it will be open for lunch. I stopped by today and chatted with partners Ben Rhodes and Rafe Hershfield about their new venture. Rhodes, a well-known Marblehead native, owns the building and for many years ran the Super Sub that Hooked is replacing. He was ready for something new, and long discussions with the enthusiastic Hirschfield gave birth to this concept. The space will feature about 32 seats in a combination of counter, high-top tables, and regular tables. Diners will order at the counter, their meals will be brought to them, and they’ll bus their own tables as they depart. A step above the familiar red-and-white checked paper baskets, the food will be served on china with flatware, and a selection of beer and wine will be served. Hershfield promises the fried offerings will be fresh, not frozen, with generous portions at highly competitive prices. Clam strip fans will be intrigued—the jumbo refers not to the portion but to the size of the clams. Unlike the standard clam shack, Hooked’s menu will include plenty of fresh fish (locally sourced when possible) as grilled and baked options, with items like swordfish kabobs over salad for healthy or gluten-free choices. Less-common sandwiches like crab cake sliders and fish tacos will also make an appearance, and the guys hinted at a few more menu surprises they have up their sleeves. Everything will be available for take-out, which is sure to please summer beachgoers and boaters. The interior is getting a complete overhaul, including a brand-new kitchen, and they plan to open in mid to late June. Rhodes says farther down the line, they are looking at turning the adjacent driveway into a patio with outdoor seating, something of which Marblehead has surprisingly little. The restaurant’s website quips “Once you try it you’ll be ‘Hooked’!” and after my visit today, I’m looking forward to returning to see if it’s true. Thanks for the heads up. I can never get enough seafood in the summer! looking forward to the new restaurant. i love the idea of take-out. good luck in your new venture. Can’t wait. I am soooo excited.